Designed for first-time users to those who have been carrying pepper spray for years, this safety kit features gel. Pepper spray is a safe, practical and effective way to subdue dangerous attackers, as recently exemplified by a video store clerk who took down an armed robber. Although a safe product, some consumers worry the spray may affect their loved ones if they are in the immediate area when it is deployed. 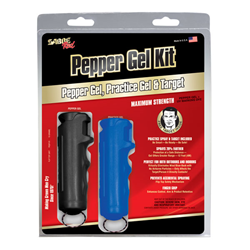 In response, SABRE has announced a new product, the Pepper Gel Kit with Keychain Pepper Gel, Practice Gel, Target & Training Video. Designed for first-time users to those who have been carrying pepper spray for years, this safety kit features gel. Pepper gel virtually eliminates airborne particles and wind blow-back, only affecting the target/person it directly contacts. This alleviates the exposure concerns occasionally associated with pepper spray. These benefits make pepper gel ideal for outdoor use, with reduced chances of wind causing the spray to affect innocent parties, including the user. This state-of-the-art formula also offers protection at an even safer distance with its increased range: Gel reaches 20% farther than traditional pepper spray. Pepper gel was originally developed for police helping them to only target a specific individual in areas where people gather such as sporting and entertainment events, government buildings, hospitals, courtrooms etc. Since it only affects the person it directly contacts, it is ideal for use in those areas and for consumer protection as well. One of the biggest advantages of the pepper gel kit is the free training video, target and practice Gel Spray. Practicing with this kit will help give SABRE users the familiarity and confidence they need to maximize their personal safety. The pepper gel and practice canister contain an industry-leading 25 bursts with a 12-foot (4M) range, offering protection against multiple threats at a safe distance. The kit is available online for just $19.99. SABRE is currently the only manufacturer offering pepper gel in a compact keychain size. The pepper spray leader has also added a variety of new gel models - including athletic, on-the-go, tactical and home defense products - to its collection in 2016. Consumers can protect themselves with industry-leading pepper gel products at http://www.sabrered.com/gel.